4/1/2019–GOLDSBORO, NC–On March 26, 2019, the Goldsboro Composite Squadron, along with other visitors, was introduced to the world of 3D printing. Mr. Mark Lee, Seymour Johnson Air Force Base’s Library IT Specialist, guided and gave the squadron a glimpse into the Hows and Whys of this exciting technology. Mr. Lee spoke about the different steps required before one can begin to print in 3D. It isn’t that there are many steps to follow, so much as the steps are exacting. One of the main steps needed in order to begin 3D printing is to make sure that you have the correct type file. 3D printers will not accept the typical jpeg type files. They require file formats such as STL & VRML. "STL" stands for stereolithography and "VRML" stands for Virtual Reality Modeling Language. The STL files are a standard file type that interfaces between Computer Aided Design (CAD) software. VRML is a standard file format that represents 3D interactive vector graphics. Once the correct file type has been loaded and is ready, printing may begin. Depending on the file size, 3D prints can take two hours or more to create. Mr. Lee also spoke of the numerous uses 3D printing is having in many fields. The automotive industry is using 3D printing to produce parts, tools, jigs and fixtures. The aviation industry uses 3D printing to produce titanium parts for the Boeing 787. NASA has been using this technology to perfect shielding on the space shuttle. Other industries such as medical, dental, construction, and even fashion are utilizing the advantages that 3D printing has to offer. Mr. Lee has been with the base’s library since 2001, and has been involved with computers since the 1980s. His interest and expertise in the IT field began with his love of computer gaming. Before he worked in the library, he served in the U.S. Navy. Specialized 3D printers are not the typical type of printer found in someone’s home. A 3D printer like the base library has costs $2,700 or more. And they require a spool of plastic that feeds into the printer to create the wonderful 3D prints. 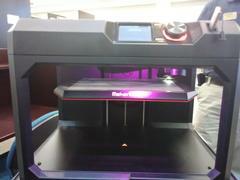 The base library will soon be offering the use of their 3D printer to anyone with base/base library access. Please contact the library for additional information.